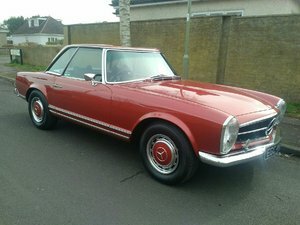 A beautiful Mercedes-Benz 280SL with 57,069 miles and Mercedes history. Light-alloy bonnet, easy-closing doors, detachable colour coded hard top, retractable soft top, impact zones, anti-burst locks, strengthened windscreen pillars, parking lamps, remote controlled door mirrors, three speed wipers, individually adjusted temperature zones, oil pressure gauge, non-slip steering wheel, lockable glove compartment, fire extinguisher, first aid kit, warning triangle, power assisted steering. Factory options; Metallic paint. 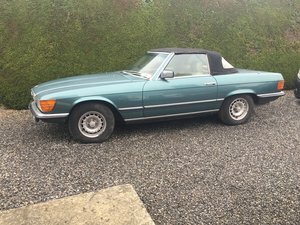 Dealer options; Mercedes tailored floor mats, Philips 750 radio cassette, tailored hard top storage bag. 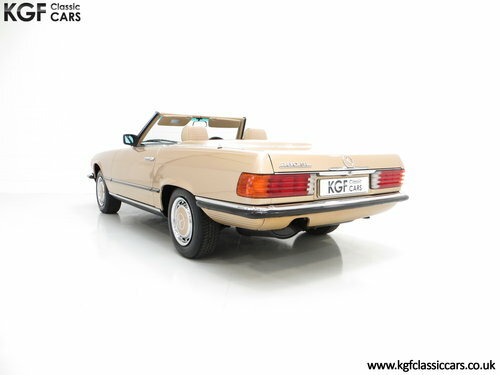 The R107 Mercedes-Benz SL achieved iconic status in the 1970’s and 80’s and became a byword for success, a car for those who had made it! Now a stalwart feature of the modern classic car era, this 280SL represents a superb example having covered just 57,069 miles from new. Finished in factory optional Champagne Metallic, (Code 473), the paintwork boasts a magnificent finish and uniform shine. This fabulously period colour accentuates the cars classic elegant lines, and even upon close scrutiny only tiny markings can be found. The original Dark Brown hood, (Code 8023), is as new, as are the side and rear hood windows. The original colour coded hard top remains with the car and is in immaculate condition, and the hood aperture is clean and displays the original foam bump stops. The high-quality chrome has a mirror finish and trim sections and rubbers are superb. 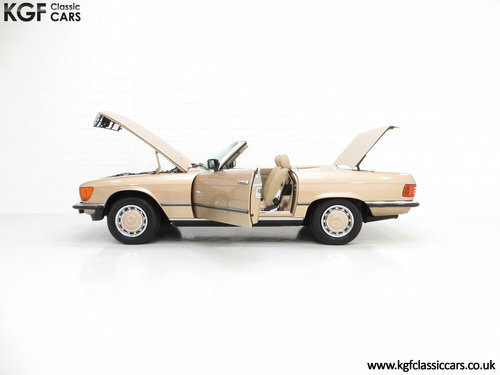 A car that excelled in engineering, build quality and craftsmanship when new, this example has been preserved exactly as Mercedes intended. 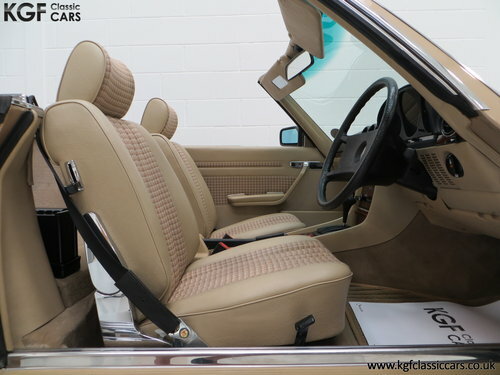 The interior of this 280SL, upholstered in matching Cream Beige fabric with leather side trim, (Code 075), has remained in fantastic condition. The seats are beautifully preserved and commensurate with the low mileage and all seat structure is fully intact with no loss of shape. One miniscule mark to the driver’s seat base can be seen and there is a virtually invisible nick to the leather upper bolster. The deep pile carpets are pristine having been protected from new by Mercedes over mats. The fascia is perfect and all the gauges, controls and electrics operate exactly as they should, including the optional Philips 750 radio cassette. The rear luggage area has the original first aid kit in the side holder and the boot area has the factory supplied toolkit as well as the original warning triangle. Originality seekers will note the rear light clusters complete with delicate manufacturer stickers still attached. 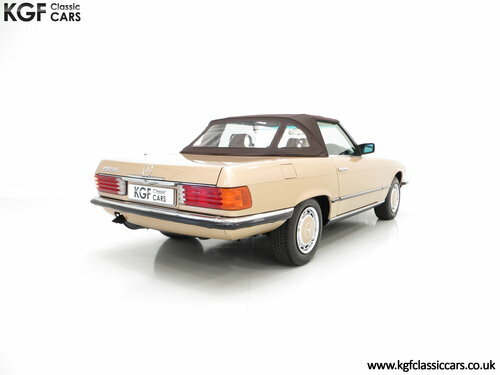 Hugely advanced ergonomically and from an era when Mercedes-Benz set the standard for all makers to emulate. The six-cylinder in-line engine fitted to the 280SL model offered a power output quoted in the manufacturer literature of 185hp and 240Nm of torque, enough to propel this driving machine to a maximum speed of 121mph whilst 0-60 is achieved in 10.01 seconds. The engine bay is spotless and retains all manufacturer stickers, plates and panel stampings. The low mileage credentials are evident in the perfect under-bonnet insulation panel which is usually deteriorated. The four-speed automatic transmission is flawless in operation with positive kickdown. The original 12-hole colour coded hubcaps with chromium plated rims are unrestored and in excellent order with only light hairline scratches to the outer edges. Quality matching Michelin Energy 195/70 R14 tyres have masses of tread and the unused spare wheel remains shod in the factory Continental Supercontact tyre which still displays the coloured banding! Dual-circuit servo assisted brakes with discs to all four wheels offer powerful stopping capabilities. 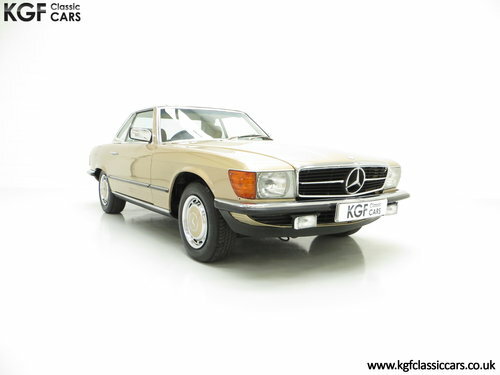 This 280SL was first registered on 9th August 1985 by Mercedes-Benz Main Dealer, Jim Russell of Norfolk. 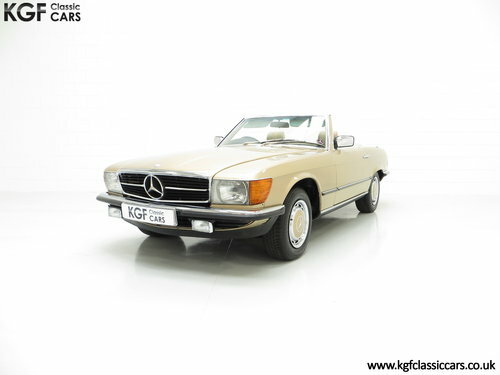 Having covered just 57,069 miles from new with only three former keepers, this example is highly desirable and suitable for the avid collector. The Mercedes plastic wallet houses all handbooks, guides and dealership literature as well as both genuine Mercedes roof levers neatly stored in the pouch holder. The original service and maintenance booklet displays the factory build card attached to the rear sleeve along with 10 stamped entries, all of which are Mercedes Main Dealer, with eight being the original supplying dealer, Jim Russell. The most recent stamped entry by Mercedes-Benz of Leeds was in May 2018 at 57,005 miles and there are two further service invoices in addition to the service record including a major service in 2016. The history folder consists of a large collection of invoices and MOT certificates as well as an original sales brochure. 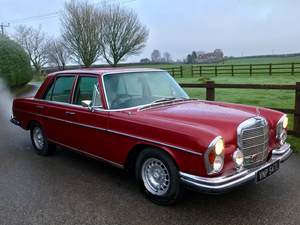 A beautifully presented example, this highly sought-after classic Mercedes-Benz will delight the new appreciative owner.